I just did a walk around my yard, and came to a conclusion: I need a camera with a powerful telephoto lens. The lilacs are in full bloom and buzzing with activity. The bees I'm not too keen on, but the butterflies are beautiful. I tried to get a picture several times, but couldn't get close enough. I figure if I had a zoom lens I could stand on my deck and zoom in close enough to get a good picture. This is what I got; not sure if you can see the butterfly in the middle or not. 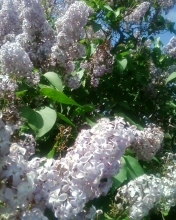 I do have to say, the lilacs are pretty though. Even with the bigger image I still don't see it. If you do, please point it out to me. The lilacs are blooming and the majority of the dandelions have gone to seed. Every now and again a little gust of wind comes up and sends the seeds into untouched areas of my lawn. I know they are good to eat, and the alpacas love them - but do they have to grow EVERYWHERE? I spent some time pulling them out of the garden beds (persistent little things) and the lawn, but the sun is too hot for me when it comes out. The alpacas did enjoy their treat though. I am cooking steak and potatoes on the barbecue tonight, as it is my daughter's birthday...Happy Sweet 16 Robyn! She also requested escargot - I'll try that on the barbecue as well. Instead of the traditional birthday cake, she requested a drumstick cake. It has been made and is now in the freezer chilling. I'm not sure how it's going to work with the candles; she'll have to be fast. I did a check around my garden last night and found my potatoes, pumpkins, sunflowers and a few other things poking through. I think the radishes will soon be ready, which will go nicely with the lettuce and green onions. I still have a few things to plant; namely my tomatoes. The only one I planted so far is the one in the ice-cream bucket. It is a little lopsided, but I think it will be okay. I have received some advice on how to reinforce the buckets so they don't bend the way the one in the photo has. It was my first attempt at an upside down tomato planter, so we will see what happens. 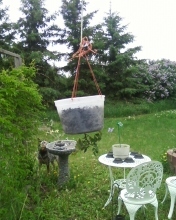 As long as the twine doesn't break, I'm happy!